We’re looking for 3 amazing Agile PMs here at Red Gate. If you think you’ve got what we need and fancy working with me, please dive in and apply. – actually we’re hiring for more than a dozen different roles you might expect in a software company! – Take a look at the rest too. Second. I’m currently supporting part of the SQL Source Control development team here on a rather challenging technology refresh project. We’re planning to ship an Alpha soon to validate our technology decisions and then press ahead with completion and new features. I can’t say much more about this at the moment but despite being relatively small by most company standards, it’s one of the trickiest projects I’ve ever inherited. Once we’re successful, I hope to write more. Forgive the Portal reference but for the last few months I’ve been using my spare time coding a game. If you’re of a certain age (like me), you may fondly remember hours of bashing away trying to solve puzzles and guess verbs in black and white (or green screen) dungeon/text adventure games. 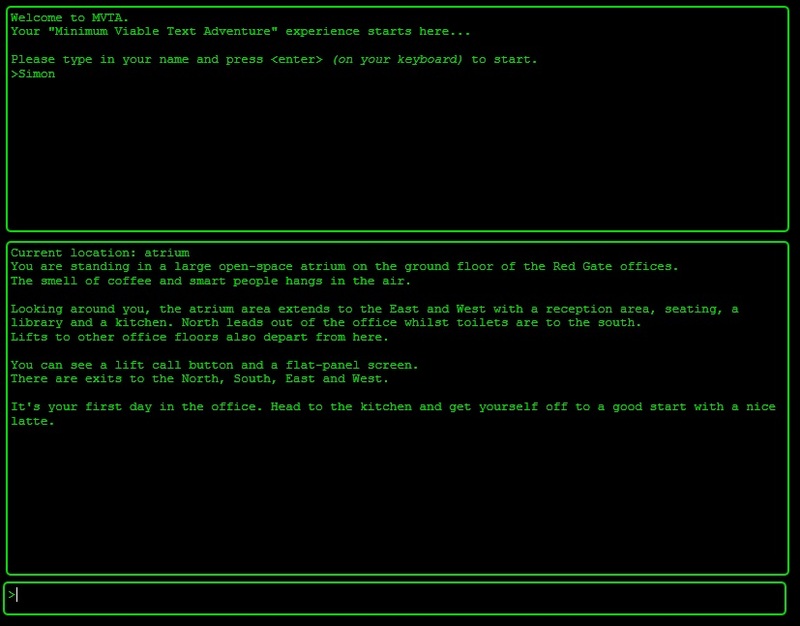 I grew up coding on a BBC micro and developed an early love for interactive fiction. It’s now a pretty niche area with some amazing games. Whenever I want to learn something new, I need a goal – something concrete. So I decided to write my own but using slightly more modern technology. If you’re interested in why, see my last post. Whilst not “finished”, it is live and that’s an achievement in itself. I reconnected my developer empathy circuit, thoroughly enjoyed going back to coding and managed to learn some new skills on the way. I’m really impressed with Heroku as a hosting platform. I managed to go from zero knowledge to live and running in under 2 hours – including restructuring the codebase and packaging in order to support heroku deployment. I’ve come to love Github for source control and got to grips with a modern IDE (Visual Studio) having last used Eclipse back in around 2007! I’ve learned to value real user testing and usage reporting. A large part of the game usability came from observing the attempted and failed actions of users playing the game. I still prefer writing business logic over coding the “plumbing” but did occasionally have to drop back to some old-school computer-sciency work to achieve what I wanted. Most importantly, whilst it’s a well-tested and working game and engine, I built a nasty legacy codebase that forces me to resort to writing tests and reworking/refactoring whenever I want to add something new and facing the pain of missing tests and regressions as I go. I’ll continue updating the content over time but please dive in, have a play and waste a few hours. Oh… and post comments here if you need “guess the verb” type hints or clues! Interesting. Despite the user testing here, I had 2 readers/users both try “go to kitchen” as their first action after posting this. The game now handles that request much more gracefully – thanks for playing!